Productivity Gold is the essential, modern-day productivity suite, helping you be your most efficient while streamlining your workflow. This is an incredible opportunity to save money on the software you already use – or it’s a chance to try a new service that will positively affect your day-to-day! Whatever your productivity pain point is, we’re sure that this bundle has something to relieve it. Here’s to a wonderful (and extremely productive) 2019! Check out the deals below to get started. actiTIME is a solution that provides a convenient way to manage project scope, assign tasks, track time, and analyze your personal productivity and business performance based on collected data. Bonsai helps 100,000+ freelancers run better businesses and get peace of mind. It handles your proposals, contracts, time tracking, invoicing, expenses, and accounting. Let Bonsai take care of the annoying or boring parts of your work, and focus on what you love. *Use the code SANEBOX201925 at checkout. Code expires February 28, 2019. ClickUp isn’t just project management software; we are the productivity platform where everything you work on is in one place – notes, goals, code, reminders, timelines, events, tasks, files, screenshots, spreadsheets and resource management. Join in on the mission to make the world a more productive place! The remote collaboration tool to help you communicate effectively & work productively. Droplr lets you. Cut down on complexity and have the job done, simply. *Use code SaneBox1Year2019. Sign up at droplr.com for a new account or email us with their current account. Then, email nicole@droplr.com with the code to apply. ContactRescue is a one-time service to extract contacts from email signatures within emails you’ve received. It’s the fastest and best way to ensure you hang on to those valuable contacts that are sitting within your email archives. The service can go back up to 1 or 5 years and also comes with a CSV you can have and take anywhere. 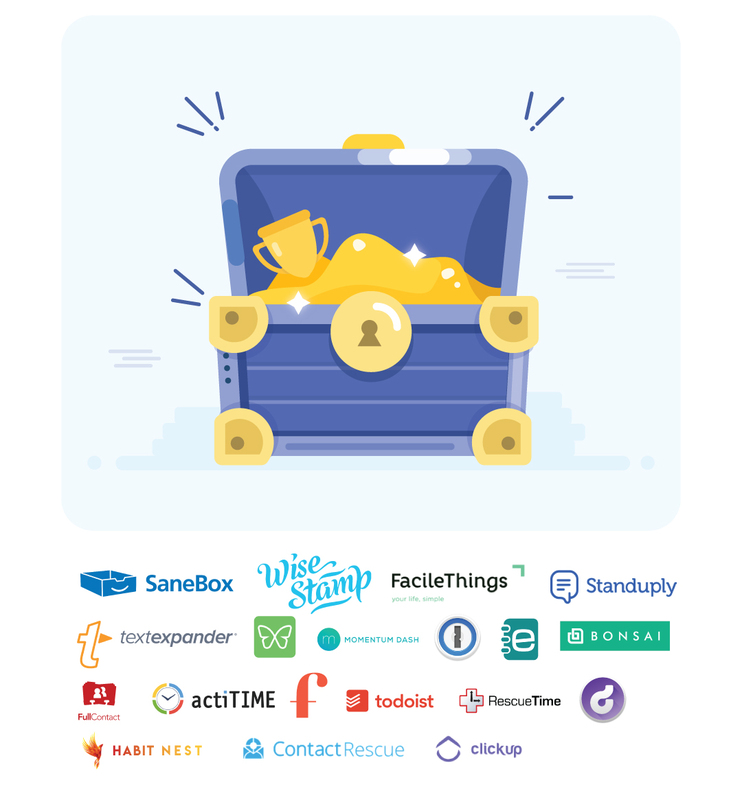 *Sign up and redeem the promo code SANEBOX-2019 in the Account section to get 40% off. Reduce distractions at work with Focus@Will, a productivity platform that combines neuroscience and music to increase your focus and help you get stuff done! Freedom blocks distracting sites and apps across all your Mac, Windows, and iOS devices so you can focus on what matters most. Freedom users report gaining an average of 2+ hours every day. Do more with your time – get Freedom now! Take the hassle out managing your contacts with features like a business card reader, automatic contact deduplication, and cross-account contact sync. Habit Nest creates journals (yes, actual books you write in) to help you build healthy habits. Their Morning Sidekick Journal can help you own your mornings, every morning. Gift yourself (or a friend) a focused and inspired 2019 with Momentum Plus! Momentum Dashboard transforms your browser’s New Tab page into a calm and inspiring homebase. Momentum Plus members have access to additional dashboard features (Event Countdowns, World Clocks, Notes and more) and customization options (Backgrounds, Quotes and Mantras). For a full list of Momentum Plus benefits, visit Momentum’s Plus information page. More than a text expansion tool, more than a knowledge base, TextExpander gives you accurate and consistent messaging in emails, forms, everywhere you type. Recall your best words. Instantly, repeatedly. Trusted by millions, Todoist is the best online task management app and to do list. For Web, iPhone, iPad, Android, Chrome, Outlook and many more! Shift is the desktop workstation for productive people. Stop wasting time switching between multiple browsers and tabs, and connect all of your email accounts and apps to one beautiful place. Shift supports Gmail, Outlook, Office 365, Facebook, Messenger, WhatsApp, Sanebox, Todoist, Twitter, Trello and 500+ other popular apps and extensions. Start building your very own productivity hub today! Download Shift for free, and upgrade at any time with your secret code. Standuply.com is a digital scrum master for Slack. Run asynchronous standup meetings via text, voice/video and track team performance. WiseStamp is the leading email signature tool used by over 850,000 professionals. It supports all major mail platforms (Gmail, Outlook, Mac mail, iPhone and many more) and allows you to create a professional email signature to brand yourself and promote your business in every email you send. No technical knowledge is needed and you can have your unique signature ready in under 2 minutes.